I vividly remember sitting in my freshman comp class many years ago on a cool October day. Professor Kemp began the class by assigning a 300-word essay on any topic to be completed by the end of class. Never being a quick thinker, I wasted the first fifteen minutes of class trying to think of an interesting topic for my essay. Desperately watching the time and realizing that a good idea just wasn’t going to materialize, I decided to write an essay about trying to decide what to write about. I’m not sure what grade I got on that essay, but I finished it by the skin of my teeth! 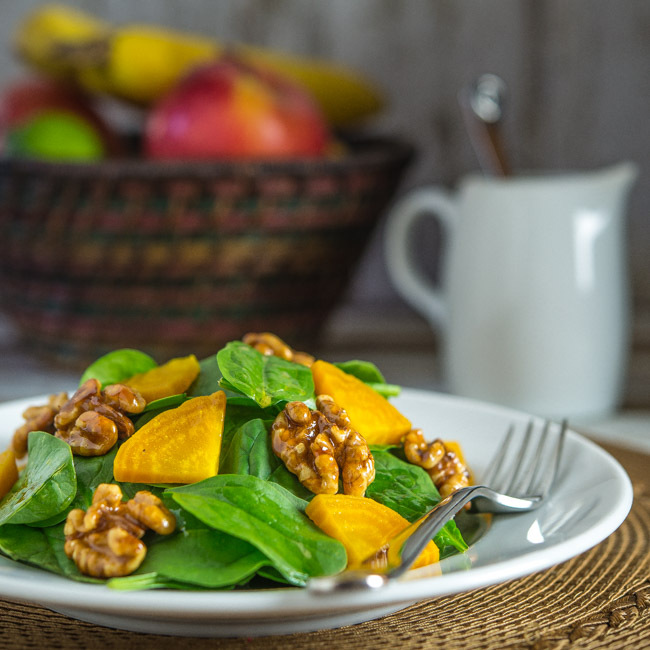 I’m sticking to my healthy start to the new year, and this salad provides a delicious double dose of vegetables with maple candied walnuts and a simple maple vinaigrette. My dinner guests thoroughly enjoyed this starter, and I think you will too. 1. Preheat oven to 400 degrees. Wrap beets in aluminum foil and place on a baking sheet. Bake for 45 minutes. Cool completely. Peelings should come off very easily with your fingers. Slice beets and cut each slice into 4 pieces. If preparing beets ahead of time, cover and refrigerate until ready to use. 2. To prepare the candied walnuts, heat 1/3 cup maple syrup in a non-stick skillet over medium heat. Stir in walnuts and 1/8 teaspoon salt. Maple syrup will begin bubbling. Continue stirring for 3 to 4 minutes until syrup has evaporated and walnuts are coated. Remove from heat and place walnuts on wax paper or a silicone mat. Cool completely. 3. To prepare dressing, whisk together vinegar, mustard, 1 tablespoon maple syrup, 1/8 teaspoon salt, and pepper. Continue whisking while slowly adding olive oil. Whisk until oil is incorporated. 4. To assemble salads, toss spinach leaves with dressing to taste. Divide spinach among 6 salad plates. Top with walnuts and beets. Serve immediately. Golden beats are great! Love their flavor. And love this salad — such a nice, satisfying combo of ingredients. Thanks. That salad was so delicious! We enjoyed the whole meal! I think we are going to incorporate that salad into our Valentine menu. We will cut heart shapes out of the beets…heart beet. Our guest will be amused! Thanks Bill for another great recipe!